Name your babe - The encyclopedia of names, to find THE name for your baby. It has never been so easy to find the perfect fitting first name for your babe! The app shows you a first name popular in your region. You don't like it? 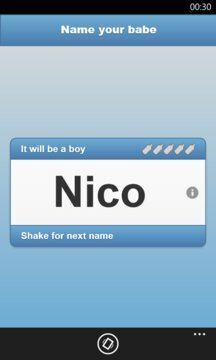 Simply shake your smartphone, and you will get a new name. I'd love to enhance "Name your babe". Therefore, your ideas and feedback are very welcome! And if you would like to have the app also translated into your language, I appreciate your assistance! Do you like "Name your babe"? - Rate "Name your babe"